Tokyo, September 28, 2016 – Fuji Heavy Industries Ltd. (FHI) today announced that it will exhibit at the Japan International Aerospace Exhibition 2016, which will be held by the Society of Japanese Aerospace Companies at Tokyo Big Sight in Koto-ku, Tokyo, on October 12-15. The theme of the FHI exhibition will be “A Global Key Player Continuously Creating New Value.” Encompassing several zones, the exhibit will showcase a range of products including aircraft and large structural components for commercial airplanes manufactured by FHI’s Aerospace Company. The main exhibits will be dynamic displays featuring large-scale models of the UH-X utility helicopter that FHI is currently developing for the Japanese Ministry of Defense in a joint international project with Bell Helicopter Textron Inc. (headquarters: Texas, USA; CEO: Mitch Snyder; hereinafter “Bell”) and the advanced variant of the 412EPI helicopter, which provides the platform for the UH-X. 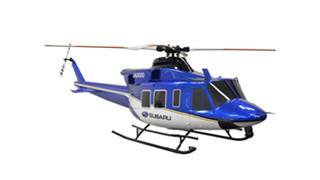 As FHI will change its company name to Subaru Corporation in April 2017, the company will further enhance its aerospace business under the Subaru brand by pursuing engineering excellence and thereby consolidate its position in the global aerospace industry. 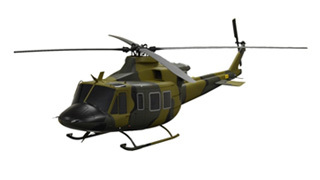 On display will be 40% scale models of the UH-X utility helicopter that FHI is currently developing for the Japanese Ministry of Defense in a joint international project with Bell and the advanced variant of the 412EPI helicopter, which provides the platform for the UH-X. The advanced variant of the 412EPI will be presented in a special color scheme based on Subaru blue. Three unmanned aircraft models in 20% scale, including the RPH-X, will be presented against the backdrop of a 180-inch multiscreen display to show realistic applications for these all-weather unmanned aircraft with long flight times. The models and graphics of other aircraft manufactured by FHI Aerospace Company, including the AH-64D combat helicopter and the T-7 trainer, will be also displayed. A large-scale graphic depicting the center wing box FHI developed for the 787 in a joint international project with Boeing will give visitors a sense of how huge the component is. A 10% skeleton model will clearly show the complex center wing box interfaces and explain the location, structure, and importance of the center wing box, which is not normally visible from outside the airplane. A movie presentation will outline the manufacturing sequence of 787 center wing box and demonstrate creative and original ideas incorporated into the manufacturing process. Attractive and novel technologies of Subaru Aerospace Company will be presented at this zone. These technologies are based on safety philosophy of Subaru about “safety in the sky” (active safety, passive safety and fale-safe). Presentations on “automatic air collision avoidance technologies” that support pilots to make flight operations even safer. Presentations and displays of test pieces used in trials of “hybrid anti-icing systems” that combine electric heaters with super ice-phobic coatings, and “structural health monitoring technologies” that aim to improve the efficiency of safety checks by using damage diagnostic device with sensor and actuator arrays to detect damage during operation. Presentations on the results of research into “fail-safe control technologies”, including outcomes of successful joint trials of intelligent self-learning systems with the University of Tokyo. The wind tunnel test model which is scaled business jet will be exhibited.